After more than three seasons of tension-filled gazes, uncomfortable moments and surprising revelations, Castle and Beckett just may be venturing on the right path to romance — for the moment, at least. “Both of them are trying to protect each other but they are missing out on the opportunity to be in a relationship together, which they both want,” Katic shared with The Hollywood Reporter. Whether that happens any time in the near future remains a mystery, for now. Katic, a supporter of The Alternative Travel Project which challenges individuals to go car-free for one day, took some time to chat with THR about the aftermath of the hostage crisis, whether Beckett is warming to Gates, a wedding and Beckett’s upcoming struggles. The Hollywood Reporter: The hostage episode was a big one for Castle and Beckett. Where are they at in terms of their relationship? Stana Katic: We got a chance to see how deeply Beckett cares about Castle. It was a moment that shined, especially at the end of the hostage episode. This is one of the first episodes ever where Castle is the one in danger and Beckett is his hero coming to save him. We’ve had so many episodes where in the course of her journey to resolve her mother’s murder, she’s been in danger and he’s been the one to come to her aid. This was a moment to show the other side of that relationship in that she cares for him just as much as he cares for her. THR: The final scene of the episode was particularly touching, with Castle inviting Beckett into his home on a more intimate level. Is the family aspect something she is searching for? Katic: We don’t get to see much of [her family life] just yet but I know that that’s something [creator] Andrew Marlowe plans on highlighting as we move on in the series so I’m sure well find some of her home life happening on-screen in upcoming episodes. You got a glimpse into what it might be like in the future if and when they get together. That was nice that we got some foreshadowing. THR: Do you have a favorite type of episode? THR: Do you think that the moment when the two do come together, that will be near the end of the series? 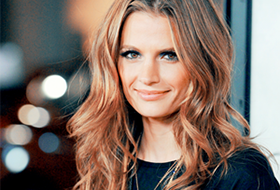 Katic: No, and I stand on that side of the line because I know a lot of people feel that that ruins all the tension. I know people who get together, it takes a while for them to figure it out. There’s something always interesting happening then. It’s not the series ender. The point isn’t to prolong tension, it should be to follow where the characters and the story leads. Let it be a natural progression. Everybody’s got secrets and that’s the theme for the season. 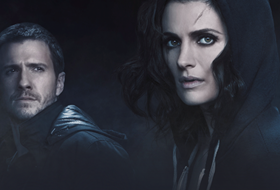 Beckett’s big secret is that she did hear Castle say, “I love you,” but she wants to make sure she’s ready before she commits and Castle’s big secret is that he’s blocking Beckett from solving her mother’s murder. Both of them are trying to protect each other but they are missing out on the opportunity to be in a relationship together, which they both want. It’s funny, if they were fully honest with each other, they would probably be able to figure it out and make something amazing happen. THR: Where do Beckett and Gates stand in their relationship? THR: In the next episode, Beckett and Gates will team up for a case. How will that affect their dynamic? Katic: Gates and Beckett have some alone time while the boys are away at Atlantic City. [Laughs] Beckett has a bit of resistance initially but realizes that Gates is quite helpful in the end. Here’s the other thing: Here’s a woman in power and Beckett’s a woman in power. Granted, Gates is more experienced, but that’s a rarity. I think it’s a great opportunity to mentor Beckett and the writers are going to direct it that way. Although we start off in rough waters, there’s going to be a lot of value resourced out of bringing Gates into the precinct. THR: Also, Beckett will be struggling with post-traumatic stress disorder in an upcoming episode. How will that affect her in the future? Katic: That was interesting. I talked to a few people about what PTSD means and I didn’t realize how widespread it is. You could be in the middle of a city, get shot or something similar happens and suffer the traumatic after-effects of that. I have a lot of compassion for people who are trying to swim out of it and try to find some kind of stability or normalcy because it’s tough. A lot of times, people that suffer from PTSD are people who have to put on a stoic front for family and friends. So you can’t even let people in on that, you can’t access help from those who are closest to you. And it’s not something that everybody can possibly understand. THR: Beckett seems to be taking more time for herself, instead of consuming herself with her work. Katic: People in life take on certain stories and say, “I’m going to be defined by this story and I’m going to live up to every inch of this story.” Sometimes you realize the story isn’t fulfilling you and in fact you’re not living the life that you’re given. This is that season where she says, “I’ve defined my life by this experience and I haven’t actually lived my own life and let go.” We’ll see more of that as we move on. THR: What can you reveal about future episodes? Katic: I’m really excited about a sniper episode coming up that plays out Beckett’s experience over the end of last season. Right now, we’re working on a really fun one where we’re going to see Ryan (Seamus Dever) finally get married. THR: Is stepping behind the camera to direct something that interests you? Katic: I’ll never direct an episode of the show. [Laughs] I will direct one day. I need some more life experience before I feel like I can do something like that comfortably. It’d be a feature, it’d be something maybe that I had in writing as well.